Warehouse Floor Label Kits Are Alternative to Overhead Signs | ID Label Inc. Warehouse floor labels are often a great solution for identifying bulk storage locations — especially for areas where overhead signage or long-range scanning are not options. 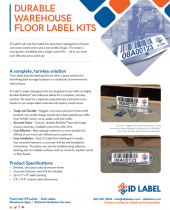 ID Label offers two floor label kits, each featuring a low-profile design for added durability. One is designed to pair with our highly durable BullsEye™ self-adhesive labels. The other features a Lexan polycarbonate protective cover. 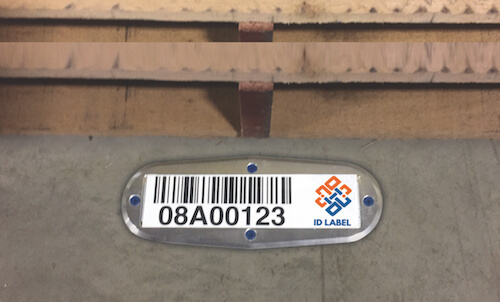 Floor plate barcode labeling kits are often a great solution for identifying bulk storage locations in a multitude of environments and surfaces. Warehouse floor labels can be a convenient way to identify bulk storage locations, especially in areas where overhead signs aren’t a viable option. Our rugged, low-profile design stands up to daily warehouse traffic from forklift trucks, carts, pallets and foot traffic. Rectangular floor label kit featuring one-piece aluminum frame with a beveled, low-profile design and ultra-durable BullsEye™ label. 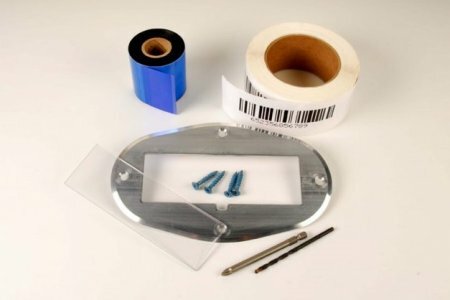 Oval warehouse floor location label kit featuring a replaceable Lexan polycarbonate protective cover for added durability and longevity. Tough and Durable – Rugged aluminum frame with beveled, low-profile design stands up to daily warehouse traffic from forklift trucks, carts, pallets and foot traffic. Accurate Scans – Custom, durable BullsEye™ preprinted laminated label or protective polycarbonate cover ensures accurate, readable scans time after time. 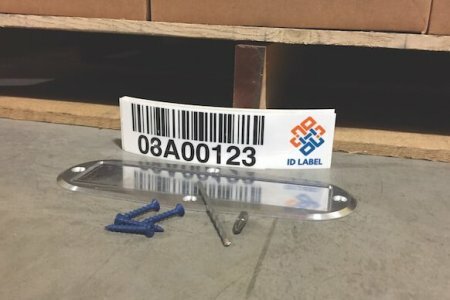 Easy Installation – Each ID Label floor labeling kit includes four concrete fasteners, a concrete drill bit and installation instructions. The plates can also be installed using adhesive backing and on multiple surfaces such as concrete, asphalt, wood or fiber board. Download our product information sheet to learn more. Or contact one of our product specialists to discuss your best options.